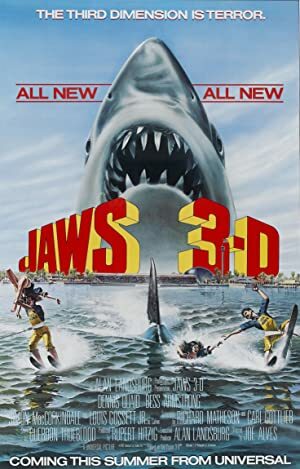 Jaws 3 (1983) – What's New on Netflix Canada Today! Several years after Amity’s former Police Chief Martin Brody electrocuted the shark at Cable Junction, his sons, Mike & Sean, are now working in different roles at Sea World Orlando. Mike is working as a park engineer and considering marriage to his girlfriend, killer whale biologist Kathryn Morgan. Sean is also involved with 1 of the park’s water skiers, Kelly Ann Bukowski. Sea World is about to open a massive ‘Undersea Kingdom’ which will bring visitors closer to marine life than ever before. The park is accessible from the ocean by a series of gates, one of which malfunctions. A young Great White Shark swims through the gate, and when a maintenance diver heads down to fix the gate he does not return. The young Great White is captured & placed in a tank but soon dies despite Kathryn’s best efforts to save it. More alarming though, is the young shark’s massive, 35 foot mother which has followed the baby shark into the lagoon and killed the maintenance diver, whose body is recovered. It isn’t long before the huge shark begins wreaking havoc, and Mike & Kathryn, along with Sea World manager Calvin Bouchard and photographer Phillip Fitzroyce, must find a way to eliminate the shark before they – or the guests – become the shark’s next meal. Actors: Dennis Quaid, Bess Armstrong, Simon MacCorkindale, Louis Gossett Jr.